Margate Town Football Club was founded in August 1896 at a meeting held at Trinity School, Margate chaired by Colonel Rowland Hill. It was agreed that a team should be formed to represent the town although there were already numerous clubs based in the Margate area. These included St.John's Guild, Margate Rovers, Margate United, Margate Swifts, All Saints, Margate Athletics Club, Trinity FC and Thanet Wanderers. Some of these teams were short-lived but several continued into the early years of the 20th century and beyond. Henry William Hall was chosen as chairman of Margate Town FC's first committee and the rest of the members were as follows: Robert Florance, Percy Searles, Oscar Skey, Albert Orchin, F Weigall, G Watson, Henry Ansell, Herbert Leetham, Albert Cozens and Sydney Emptage. Several members also played and Colonel Hill became the club's first president. He had previously been involved with Thanet Wanderers FC, as had many of the club's initial squad of players. Edward Taylor-Jones was chosen as Margate's first captain, Albert Sprules was vice-captain and Arthur Stickels became Honourary Secretary. That role was the closest to that of a modern day manager. Margate Town's first ever game was played on Wednesday 28.10.96 at Clare House in Northdown Road, Cliftonville. The pitch was in the grounds of a private school and it was owned by Henry Hall, the club's committee chairman. Margate beat Wye 5-1 in a friendly and played their first away game on 14.11.96 when they lost 3-0 at Dover. In addition to Clare House, Margate also played at two other home grounds during the 1896/97 season. One of these was a pitch at Arthur House which was another private school in Arthur Road, Cliftonville. The ground was lent to the club by Mr James Deacon Holt. Later matches were played at Blowfield which was the cricket ground at Margate College. The private school was close to Union Crescent and Addington Street in Margate and the shopping development including Iceland and Morrisons now stands on some of the site. The ground was lent to Margate by the Principal and founder of the College, Mr William Leach-Lewis who was Mayor of Margate on three separate occasions. ...all of these games were friendly matches and the local press noted that Margate's side wore a variety of different coloured shirts for a match against Ramsgate St.George's in March 1897 although usually the team wore black and white striped tops. At the end of the campaign the Isle of Thanet Gazette said "The Margate Football Club may congratulate themselves on their first season's work". In the years that followed Margate Town continued to play friendlies on a regular basis and home games were usually played at Blowfield, Margate College apart from some matches at Clare House during 1897/98 and 1898/99. From 1897/98 to 1904/05 inclusive the club's only competitive matches were in the Kent Junior Cup. A new stand was erected at Blowfield prior to the start of the 1899/00 season and it was first used for a competitive game on 28.10.99 when Margate beat Broadstairs Town 3-0. By then Johnny Hall was Margate's Honourary Secretary. There was a problem at Blowfield with people watching matches for free so a large sheet was used to prevent those that hadn't paid from seeing games. George Bowes took over as Honourary Secretary for the 1900/01 campaign and he was then replaced by Herbert Gutteridge ahead of the 1901/02 season. Gutteridge went on to spend around ten years in the role which, as previously noted, was similar to that of a modern day manager. On 1.3.02 Margate Town won their first trophy when goals from Harold Crosoer and captain Freddie Pearce secured a 2-1 win over Ashford Park Rangers in the Kent Junior Cup Final at Southwood, Ramsgate. Margate were the first Thanet team to triumph in the competition. Margate Town moved to a new ground known as Northdown Corner or the Margate Athletic Ground for the 1903/04 season. It was situated in Cliftonville off Northdown Road between Northumberland Avenue and Holly Lane. There was a tram stop close to the entrance and the rent charged by its owners The Margate Athletic Company was initially £40 per year. The club had had to leave Blowfield (where they'd never been charged rent) as some of the pitch there was about to be built on by Margate College. The first match at Northdown Corner was a friendly against Sheppey Amateurs on 26.9.03 and Margate's club flag was usually flown from a pole at the ground to indicate a game was taking place. The unusual design of the stand at the enclosure prompted a lot of criticism from supporters and at one point during 1903/04 the local press made a point of stating that Margate were not responsible for either its design or erection whilst describing it as an "ungainly-looking structure". The pitch at Northdown Corner was enlarged to a size of 120 x 80 yards in the summer of 1905 and the local press reported that Margate Town had a "magnificent balance at the bank" of £90 as the 1905/06 campaign started. It was also noted that Margate's officials had asked all players to wear the club colours of black and white stripes and, if need be, shirts could be obtained from Mr Thomas Coleman of Paradise Street. Margate entered the Kent Senior Cup for the first time during the season and lost in the final of the Margate & District Charity Cup - another new competition that the club themselves had instigated to raise funds for local hospitals and charitable organisations. At the end of the campaign the a local newspaper said that Margate Town's record for the season compared to the numerous other Thanet clubs was "the worst of the lot" and felt that the club suffered due to being unable to field the same team on a regular basis. In closing the paper noted "it does seem a pity that Margate has not got a team worthy of its name". The following season - 1906/07 - Margate entered both the FA Amateur Cup and Kent Amateur Cup competitions for the first time and won the Margate & District Charity Cup. The club went on to win the trophy three more times before the outbreak of World War I in 1914. Margate Town were given a new three year lease on Northdown Corner at the start of the 1907/08 campaign and finally progressed into regular competitive football when the club joined the Thanet League for the start of the 1909/10 season. Margate's first ever league game was away to Ramsgate on 20.11.09 and a special tram ran from St.Paul's Church in Cliftonville to the Rams' ground at Dumpton Park. The fare was 4d return but the travelling supporters didn't have much to cheer as Margate lost 5-0. The club eventually finished fourth out of the five competing teams. In April 1910 there were doubts as to whether Margate Town could stay at Northdown Corner or even survive at all due to financial problems and the Isle of Thanet Gazette said local people "would be exceedingly grieved to see the death of the club which has provided them with excellent sport and weekly relaxation for so many years". In the end the club carried on at Northdown Corner for the 1910/11 campaign but the season was something of a disaster. Margate finished bottom of the Thanet League that by then had expanded to feature six clubs and only won one of their ten league matches. Things reached an all-time low on 25.2.11 when only eight players could be fielded in a match at Faversham. Margate lost 12-0 which at the time of writing was still the club's worst-ever defeat and on 18.3.11 only nine players turned out in the final game of the season at Whitstable. At the end of 1910/11 Margate's committee decided to disband the club as they were having major difficulties finding enough local players to fit in with the club's policy of not 'importing' players from outside Thanet. However Margate Town ended up continuing without a break as a new committee was immediately formed who decided to bring in players from outside Thanet for the following season. The new committee turned Margate into a semi-professional side for the 1911/12 campaign as some of the players were paid and the club also joined the Kent League Division 2 (Eastern Section) whilst still competing in the Thanet League. Margate finished third out of the four remaining teams in the Thanet League and seventh out of eight clubs in the Kent League. Margate Town moved to a pitch in the grounds of a seafront amusement park known as the Hall By The Sea for the start of the 1912/13 season and the park later (in 1919) became known as Dreamland. The Hall By The Sea pitch had previously been used by St.John's Guild and during their tenure there (which started in September 1905) it had generally been known as The Eaton Road Ground. There was no stand at the Hall By The Sea but deck chairs were positioned around the pitch on match days. A major problem was that the pitch was surrounded by higher ground where people could watch matches for free. Margate Town continued playing in both the Thanet League and Kent League having reverted to using only amateur players and at one stage during 1912/13 fielded five different goalkeepers in five consecutive competitive games. That tally remained a record until a run of six keepers in six matches during the 2009/10 campaign. Margate won the Thanet League during the 1913/14 campaign and the season also saw the club enter the FA Cup for the first time. Margate won 1-0 in an Extra Preliminary Round tie at Folkestone on 13.9.13 and then lost 3-1 at Dartford in the 1st Qualifying Round on 27.9.13. However the club were struggling financially due to small attendances that were attributed in part to the lack of shelter at the Hall By The Sea. The 1914/15 campaign was abandoned due to the start of World War I and Margate Town had only played one competitive game at the time. When hostilities ceased in 1918 Margate Town turned professional and joined the Kent League Division 1 for the start of the 1919/20 campaign, still playing at the Hall By The Sea ground. However during the season the club were forced to move to a different part of the site following the change of ownership at the amusement park that saw it renamed Dreamland. The new pitch was on a field that was used for weekly firework displays during the summer season and had a bank of uncovered tiered seating on one side. In later years the field was concreted over and used as a car park. However as late as 2006 some of the terrace steps could still be seen. Margate Town moved to a new ground at Westbrook / Garlinge for the 1920/21 term and it was opposite 'The Hussar' public house in Old Crossing Road. Margate's new home was usually known as The Canterbury Road Ground but was also sometimes called The Mutrix Stadium and featured a stand containing 700 seats that was built at a cost of £600. The club won the Kent Senior Shield for the first time during the season and employed a Mr G Higgens as paid secretary for the 1921/22 campaign. The 1922/23 campaign was a dismal one and Margate Town finished second to bottom in the Kent League. At the end of the season the club were suspended sine die by the Football Association via the Kent County Football Association for financial irregularities. They included not paying a player called Rumbold outstanding wages and Margate had lost £1,700 over the course of the 1921/22 and 1922/23 campaigns. The club had also upset the Kent League by playing Harry Reay when he was supposed to be suspended. In July 1923 the Football Association asked to see Margate's accounts but the club only sent a minute book recording details of meetings and shortly afterwards Margate Town folded. As a result there was no senior football in Margate during the 1923/24 season. The club reformed as Margate Town FC for the 1924/25 season and were accepted back into the Kent League with a new squad of players. Mr R O McHale was the new secretary. The club started the campaign at the Canterbury Road ground but in October 1924 Margate Town returned to what was by then Dreamland. They soon gained the nickname 'The Dreamlanders'. Local amateur side Margate United Services took over the Canterbury Road ground and it continued to be used for several more years. Margate Town played on the firework field pitch at Dreamland and that was to be the club's home until the end of the 1927/28 season. Initially there was no cover at the ground and no hard standing but 'duck boards' were put down later in the 1924/25 campaign. After a mediocre first two seasons at Dreamland Margate Town finished third in the Kent League during 1926/27. The final home game, a 1-1 draw with Northfleet United on 7.5.27, was marred by a post-match pitch invasion during which sticks and stones were thrown. The cause of the trouble was the poor performance of the referee, a Mr Edwards, and in the chaos he was hit by a brick and had to be rushed away in a motor car via a back entrance at Dreamland. Margate Town were let off with a warning but Mr Edwards was struck off the Kent League's officials list due to incompetence. Earlier in the campaign - on 13.11.26 - three Margate players had left the field due to the effects of cold weather in a match at Royal Marines Chatham and three players from the home side had also left the pitch. During the 1927/28 season Margate Town were runners-up in the Kent League under secretary / manager Mr H J Inch and at that time the club's president was Esmond Harmsworth who was the MP for the Thanet East district. When he was originally elected on 15.11.19 he'd become the youngest MP in history aged 21 years and 170 days so he was still aged under 30 when he became Margate's president. At the end of the 1927/28 campaign Margate Town folded once more due to heavy debts. These were partly caused by the defection of many of the better Kent League clubs to the Southern League, resulting in a reduction in fixtures, especially against local clubs, and a fall in attendances. Because of that, the club's cripplingly high wage bill was out of all proportion to it's income and there was no senior team in Margate during the 1928/29 season although Margate Amateurs used the Dreamland ground. The club reformed once again for the 1929/30 campaign having raised around £600 by issuing shares and dropped the 'Town' suffix, the full name of the new club being Margate Football & Athletic Club. Margate changed their colours from white shirts (Margate Town had previously been known as 'The Lilywhites') to amber and black stripes and were sometimes nicknamed 'The Wasps'. The club joined the Kent League as a professional side under manager Arthur Graves and the Margate Corporation Council agreed to provide a new ground for the club, in Hartsdown Park. The park had been purchased by the Corporation for £23,000 from Mrs Hatfeild, former Mayor of Margate, on the understanding that it would be for the use of the people of Margate, in perpetuity. The Council agreed to let four and a half acres of the park, along Hartsdown Road, to the football club, for three years, at a rent of £200 per annum inclusive. They also agreed to fence the whole area and to erect a stand with seating for 500 people. The use of Hartsdown House (200 yards away) for changing rooms and provision of a full time groundsman were also part of the agreement. The initial cost to the Council was £1,324. The first match at Hartsdown Park was a friendly against Folkestone on 31.8.29 and Hartsdown Park & House were officially opened on 5.9.29, although initially there was no cover at the ground as the main stand was not completed until December 1929. The first competitive match was against Dover in the Kent League on 14.9.29 and Margate won 6-1. Margate finished the 1929/30 season as runners-up in the Kent League, three points behind Gillingham, and the side featured Dutch goalkeeper Gerry Keizer who joined the club from Ajax of Amsterdam. The following season he played for Arsenal and became the first professional European footballer in the Football League. 1929/30 saw Margate venture beyond the qualifying rounds of the FA Cup for the first time, winning 2-0 away at Third Division Gillingham in the 1st Round before losing 6-0 at Northampton in the 2nd Round. On 22.3.30 Margate beat Folkestone 2-0 in the Kent Senior Cup semi-final at Dover United's Crabble Athletic Ground in front of a crowd of 6,221 - an all-time record for the enclosure. Three special trains were laid on by Southern Railway and dozens of coaches also made the trip from Margate. The team triumphed wearing Dover United's kit of light and dark blue striped shirts that they'd had to borrow due to a colour clash with Folkestone. The club also reached the final of the Kent Senior Cup but lost 3-0 to Sittingbourne in a match watched by a crowd of over 9,000 at the Athletic Ground, Maidstone. The players were loudly cheered as they left the field after beating Grays Thurrock Reserves 2-1 at Hartsdown Park in the last game of the season on 3.5.30 and the local press reported that a female supporter embraced several players as they ran off whilst waving aloft her model of a wasp. She was Gertrude Thornton who later became a prominent member of Margate's Supporters Club and was still watching matches in the late 1970's. A journalist who used the pen name 'Magpie' praised Margate's performances during the season and wrote "sound teamwork and good comradeship are two of the chief factors of the team's success...had it not been for injuries I feel sure they would have won the league". At the club's Dinner & Dance in May 1930 Margate's directors said they were aiming to get a good professional team for the town as other seaside resorts such as Southend and Brighton had managed to get sides into the Football League. Margate Town started the 1930/31 campaign in great form and were unbeaten in the first 11 matches of the season. On 11.2.31 a goal from Eddie Wade was enough to secure a win over Tunbridge Wells Rangers in the Kent Senior Shield Final at Maidstone and it earned Margate their first trophy since the club's previous Kent Senior Shield triumph during 1920/21. Manager Arthur Graves also guided Margate to a third place finish in the Kent League. In the summer of 1931 the stand at Hartsdown Park was extended to add more seats and six feet was added to the front of the structure to protect spectators from the elements. In addition a covered shelter for 2000 people was erected on the opposite side of the ground to the existing main stand. In August 1931 two baseball games were played at Hartsdown. Margate enjoyed a good start to the 1931/32 season, winning their first five games, and midfielder Nick Collins was a key member of the side. In December 1931 he was fortunate to escape serious injury after a motorcycle crash which also involved his brother Joe who'd played once for Margate during the previous season. At the start of 1932 the Isle of Thanet Gazette printed a review of the first half of the campaign and in March 1932 former Football League goalkeeper Stewart Dobbin joined the club. Margate eventually finished fourth in the Kent League with striker Arthur Stennings scoring a remarkable 40 goals from just 28 appearances. On 14.5.32 the Gazette published a report on a meeting about Margate's future which revealed the state of the club's finances and also mentioned that Margate were against any kind of possible 'nursery' link-up with a Football League club. A few weeks later the Gazette also published a report on Margate's annual general meeting. In the summer of 1932 Margate appointed Bill Fogg as player-manager and he replaced Arthur Graves who became a director of the club. Fogg was chosen after Margate received over 80 applications for the post and on 13.8.32 the Isle of Thanet Gazette published a preview of the 1932/33 season which mentioned the capture of Welsh international striker Billy Mays who went on to score an incredible 60 goals from just 43 appearances during the 1932/33 season - an all-time club record. In September 1932 Bill Fogg wrote an open letter to supporters after Margate started the campaign by losing two of their first three Kent League games and a club advertisement also hinted that the Hartsdown Park crowd should be more patient. At the start of February 1933 Margate's chairman Alfred Stickels made an appeal in the local press for more support and a week later former player Harry Lord responded. On 23.2.33 the club made an amazing signing when one of the best-known players in British football, 27 year-old Alex Jackson, also known as 'The Laughing Cavalier', joined Margate. The right winger / inside forward was a former Scottish international who'd scored a hat-trick as Scotland beat England 5-1 at Wembley in 1928 and he'd also won back-to-back First Division titles with Huddersfield in the 1920's. Jackson had started the 1932/33 campaign with First Division Chelsea before falling out with the club in a dispute over wages and signed for Margate having been offered £10 per week to play - a huge amount at the time. 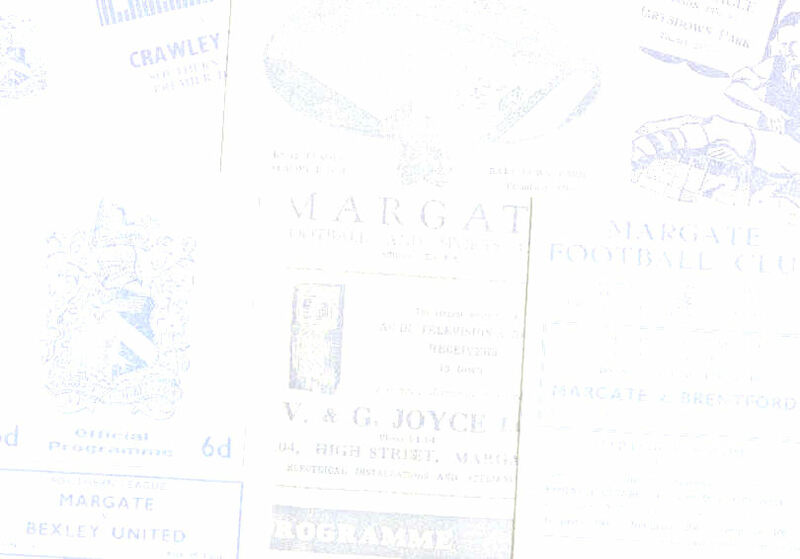 Within days of the Jackson signing Margate made a public appeal for donations in the Isle of Thanet Gazette and in the weeks that followed several letters about the club were published by the paper. Alex Jackson only played seven games for Margate and his last match on 1.4.33 marked the start of a remarkable run of nine consecutive wins that saw the club clinch the Kent League Division 1 title for the first time in its history by the narrowest of margins - goal average. Margate also progressed to the 2nd Round Proper of the FA Cup during the season where they lost 5-2 at Third Division (North) club Gateshead. The 1st Round Proper tie at home to Ryde Sports from the Isle of Wight on 26.11.32 had been Margate's first ever home tie in the FA Cup Proper. To celebrate a tremendous season The Queens Highcliffe in Cliftonville hosted a dinner and dance for Margate's players and officials and the Isle of Thanet Gazette published an extensive article about the campaign. Due to financial reasons and the fact that he hadn't made many appearances during 1932/33 player-manager Bill Fogg's contract wasn't renewed and in May 1933 midfielder Len Hughes was announced as Margate's new player-manager for the 1933/34 season. The club joined the nine team Southern League Eastern Section as well as continuing in the Kent League and did so having made a profit on the 1932/33 campaign. On 30.6.33 the club's annual general meeting was held at Margate Town Hall and prompted a letter to the Isle of Thanet Gazette from a disgruntled supporter. New signings included winger Fred Le May, reputedly the shortest player ever to play in the Football League, prolific striker Frank Keetley and centre-back Tommy Robinson who'd previously captained Torquay. Margate's first-ever Southern League match on 7.9.33 saw them beat Clapton Orient Reserves 2-0 at Hartsdown Park with goals from Ernie Braithwaite (another new signing) and Nick Collins. Some 67 years later Leon Braithwaite and Phil Collins would be key figures as Margate won the Southern League Premier Division title. Margate won their first six matches of 1933/34 to set an all-time club record of 15 consecutive wins and in October 1933 former Arsenal striker Reg Tricker joined the club. Margate eventually finished as runners-up to Norwich City Reserves in the Southern League whilst coming third in the Kent League. Once again there was an appearance in the FA Cup 1st Round as Margate lost 2-0 at home to Third Division (South) club Torquay in a replay after a 1-1 draw in Devon. On 21.5.34 a professional boxing bout between Les Greenaway of Wales and Margate boxer Willie Smith was staged at Hartsdown Park. June 1934 saw the most important development in Margate FC's history to date. Following a similar arrangement between Margate's North Kent rivals Northfleet United and Tottenham Hotspur, Margate became the official 'nursery' club of Arsenal, then the top club in the country. The agreement meant that Arsenal would send down promising players to Margate, very often before they'd played for the Gunners at any level, to give them experience before going back to Highbury. The link-up with Arsenal came about as future Arsenal manager George Allison had a daughter who boarded at a school in Thanet and while in the area in 1933 he visited an old friend Mr E H White who took him to a friendly match at Hartsdown Park. Mr White suggested the 'nursery' idea and Allison later met Margate chairman Alfred Stickels. When Allison became Arsenal's manager in January 1934 he raised the idea of a 'nursery' arrangement to the Gunners' board and an agreement was signed on 16.6.34 by Allison and Stickels at the Kingsgate Castle Hotel in Broadstairs. Arsenal had considered linking up with other clubs including Northampton before deciding on Margate. In addition to sending young players to Margate, Arsenal provided a manager, Jimmy Ramsay, and trainer / coach Willie Arbuckle who had previously been coach of Britain's Olympic football team. Arsenal paid Ramsay and Arbuckle's wages as well as 60% of the wages of the players they provided which ended up costing the Gunners around £2,000 per season. Meanwhile Margate Council agreed to spend £1,050 on Hartsdown Park to provide new dressing rooms and toilets behind the stand. The dressing rooms were first used on 20.10.34 when Margate played Plymouth Argyle Reserves in a Southern League game. The North Stand (facing the main stand) was also built at that time and it was later fitted out with seats from the original main stand at Highbury. Meanwhile the pitch at Hartsdown Park was reduced to exactly the same size of that at Highbury. It was the beginning of a great period for Margate who by then were simply Margate Football Club rather than Margate Football & Athletic Club. During the 1934/35 season Margate competed in both the Eastern and Central Divisions of the Southern League, as well as playing in the Kent League. The club were obliged to field their strongest team in the Kent League fixtures although other Southern League sides could field their reserves and ended up playing 83 matches that counted as first team games. Players frequently switched from the Kent League to Southern League sides and notable names in Margate's squad were former Arsenal striker Reg Tricker who scored 40 goals in as many matches, Charlie Walker who later managed the club and former Scottish international John White. Margate finished 3rd in the Southern League Eastern, 6th in the Southern League Central and 3rd in the Kent League. The club also played an FA Cup 4th Qualifying Round 2nd replay against Folkestone at Highbury on 19.11.34. The match was abandoned because of fog with Folkestone leading 4-3 but when Margate were found to have fielded an ineligible player the tie was awarded to Folkestone. It was the only time Margate played at Arsenal's stadium. The 1935/36 season saw Margate really reap the benefits of the 'nursery' arrangement with Arsenal and it was the most successful in the club's history. Margate were allowed to field their reserve team in the Kent League and the first team who competed in the Southern League boasted more experience in the shape of goalkeeper Charlie Preedy and striker Jack Lambert who'd both played for Arsenal in the 1930 FA Cup Final. On 3.10.35 Margate took on Arsenal's first team in a friendly at Hartsdown Park with the Gunners winning 5-0. Margate enjoyed a great FA Cup run during the campaign, beating Queens Park Rangers 3-1 at Hartsdown Park in the 1st Round and Crystal Palace by the same scoreline in the 2nd Round, also at Hartsdown Park. In the lead-up to the Crystal Palace tie in December 1935 some of the Hartsdown Road end was covered after Arthur Weston of Weston Dairies donated the necessary funds and the structure became known as the Arthur Weston Stand. In the wake of the win over Palace the Margate Corporation street sweepers' carts were repainted in Margate's colours of black and amber in honour of the club's efforts. Margate were drawn away to Blackpool in the 3rd Round in January 1936 and it was the first time the club had progressed to that stage. Shortly before the match took place the Isle of Thanet Gazette published its review of the season so far. The Margate team stayed in nearby Cleveleys for a couple of days before losing the Blackpool tie 3-1 on 11.1.36. The FA Cup run subsequently led to all 'nursery' sides being disqualified from the competition in future as Margate could have been drawn to play Arsenal in the 3rd Round. However by the time the FA rubber-stamped the ban Margate had already been accepted into the competition for the following season and so played an FA Cup tie during 1936/37 despite still being a 'nursery' club. Margate's 1935/36 ties against Crystal Palace and Blackpool were both covered by newsreel companies and the remarkable footage (easily found on the internet) represents the first time the club were ever captured on film. At the end of January 1936 manager Jimmy Ramsay suddenly resigned and captain Jack Lambert took over as player-manager. The club then lost their oldest supporter, a Mr Thomas Jennings, in February 1936. Margate ended up winning four of the five competitions they entered during 1935/36 with the only exception being the FA Cup. Both the Southern League Eastern Division and Southern League Central Division titles were secured and Margate also won the Kent Senior Cup for the first time, beating Tunbridge Wells Rangers 2-1 in the final at Maidstone on 13.4.36. A few days later Jack Lambert addressed a huge crowd outside Margate's Cinque Ports Hotel who'd gathered to see the trophy and said "Now we have the cup here we are going to try and keep it". On 27.4.36 the club added the Kent Senior Shield to their haul after winning 1-0 in the final at Folkestone. The club's average league gate during 1935/36 was 1500 and Margate made a loss of £344 on the season. That was mainly due to Margate's 40% of the wage bill of £3095 which accounted for more than half of the club's total expenditure of £5814. If Arsenal hadn't been paying the other 60% of the wages the campaign would have been a financial disaster. On 2.5.36 the Isle of Thanet Gazette published an article about Margate's retained list which revealed there would be major changes to the squad for the following season and the paper followed the story up a week later with a piece looking back at the triumphant campaign. Manager Jack Lambert had to rebuild the Margate side for 1936/37 after many of the Arsenal players were recalled by their parent club or left the Gunners to play elsewhere. The result was a very young first team squad with an average age of just 19. There was early silverware in September 1936 as Margate beat the 1935/36 Southern League Western Division champions Plymouth Argyle Reserves 2-1 at Hartsdown Park to win the Southern League Championship match and it was the first trophy of another excellent season. Margate's young side won the Southern League Midweek Section and retained both the Kent Senior Shield and Kent Senior Cup with wins over Folkestone and Tunbridge Wells Rangers respectively. The club also finished fourth out of the 16 clubs in the main section of the Southern League. Key players during 1936/37 included Arsenal youngsters Horace Cumner and Mal Griffiths who both went on to become Welsh Internationals whilst Reg Lewis later scored the two goals that won Arsenal the FA Cup in 1950. Several top Arsenal players such as Cliff Bastin and Eddie Hapgood also trained at Margate to recuperate from injuries during the season but didn't actually play for the club. Although it had been another very successful season on the field Margate's average attendance of around 1300 was well below the 2000 required for the club to break even and the club lost over £2500 on the campaign. In April 1937 the club gave notice to the Southern League that they were withdrawing from the competition due to the expenses related to participating and a public meeting was held at the Winter Gardens. Arsenal manager George Allison attended the meeting and explained how much the 'nursery' arrangement was costing the Gunners. He also stated that he felt the amount of fixtures in the Kent League and Southern League put too much strain on the young players sent to Hartsdown Park by Arsenal. The outcome of the meeting was that the existing football company was to be liquidated and a new football company formed with capital of £1500 in £1 shares but there was a very poor response to the scheme. Having left the Southern League Margate returned to the Kent League Division 1 for the 1937/38 campaign and the new youngsters from Arsenal included Sid Pugh and Henry Waller who both later played for the Gunners' first team. 16 year-old local player Les Fell also joined the club and he would later play for Charlton in the 1946 FA Cup Final. Margate began the new season in terrific style with a run of ten consecutive wins that constituted the club's best-ever start to a campaign and went on to win 14 of their first 15 matches. In September 1937 Margate won the Southern League Championship Match for the second time with a 6-2 win at Ipswich and the club finished the season as champions of the Kent League. Margate couldn't play in the FA Cup due to the ban on 'nursery' clubs entering the competition taking effect but reached the final of the Kent Senior Shield where they lost 1-0 to Folkestone after a replay. At the end of the 1937/38 season Arsenal and Margate mutually agreed to end the 'nursery' arrangement. The Gunners felt it was costing the club too much money and by then Margate were heavily in debt. The directors felt they could no longer continue to subsidise the club and with no prospect of further funds being made available Margate FC folded in June 1938. It was a sad conclusion to the most successful period of the club. Had Margate continued the famous Arsenal centre-half Herbie Roberts was to have become the club's trainer. There was no Margate FC during the 1938/39 season but the club reformed as Margate Football & Sports Club for the 1939/40 campaign and at that time a new wooden stand was erected at the top end of the ground. Bill Fogg became manager again having previously been in charge in the early 1930's but after playing just two matches in the Kent League the Second World War began and all competitive football was suspended in September 1939. Margate played four friendlies during October 1939 and then towards the end of the month the Kent FA announced that a new regionalised Kent League was to be created with immediate effect. Margate were placed into the Eastern Section of the newly-formed Kent Regional League and completed a 20 match programme but at the end of the 1939/40 season the threat of invasion brought Margate into the front line of the war and the club closed down once more. The club reformed in 1946, once again as Margate Football & Sports Club, and it was decided that it should be run by a committee of club members, elected annually. Bill Graham became chairman and former Arsenal and West Ham player Charlie Walker was appointed as player-manager. He had previously played for Margate during the 'nursery' years. The club enjoyed a successful first season and won the Kent League championship. The following season, 1947/48, Margate retained the Kent League championship and also won the Kent League Cup and the Kent Senior Shield to complete a memorable 'treble'. An article in the local press provided details of the club's finances. However at the end of the season Charlie Walker was sacked as manager as it was felt that a new business interest meant that he wouldn't be able to devote enough time to Margate. His dismissal was highly controversial and a special meeting of club members was convened to discuss the possibility of him being re-instated. But the decision to terminate his contract was upheld and as a result Walker joined Ashford as their player-manager for the 1948/49 campaign, going on to win the Kent League title with them at the first attempt. Alex Weir was appointed as Margate's new player-manager for the 1948/49 season but he too was sacked before Christmas after a bad run of results. The club committee ran the team for the remainder of the campaign but it wasn't a successful season, Margate finishing 10th in the Kent League. At the start of the 1949/50 campaign the club changed their colours from amber and black to blue and white. That came about as one of the club directors was an ardent Huddersfield Town supporter. Jock Basford became Margate's new player-manager in June 1949 and guided the club to a disappointing 6th place in the Kent League. As a result his contract wasn't renewed at the end of the season and Margate were once again looking for a new manager. In the summer of 1950 former West Ham and Spurs player Almer Hall was the man appointed as the club's new player-manager and he went on to spend a remarkable 20 years in charge. However the next few seasons were not very successful, although Margate were runners-up in the Kent Senior Shield during the 1950/51 campaign. The club also played numerous friendly matches against Football League clubs during the early 1950's and opponents included QPR and Chelsea. During the 1952/53 season Margate shared the Kent Senior Shield after a draw with Folkestone and were also runners-up in the Kent League Cup. Around that time the Arthur Weston Stand which was erected at the Hartsdown Road end of the ground was blown down during a gale and was rebuilt by the Supporters' Club. The 1953/54 season saw Margate win the Kent League Cup and they also finished as runners-up in the Kent League. The 1954/55 campaign saw the club lose to Tunbridge Wells in the finals of both the Kent League Cup and Kent Senior Shield. In the summer of 1955 the club reverted to the name Margate Football Club having abandoned the Margate Football & Sports Club title. During 1955/56 Margate reached the later stages of the FA Cup once more for the first time since 1936/37, losing away to Walsall in the 1st Round after a replay. They also finished as runners-up in both the Kent League and Kent League Cup. In 1956 the terracing at the bottom end of Hartsdown Park was constructed and it was called the Cornhill Stand, although in later years it became known as the 'Coffin End'. More FA Cup success came Margate's way during 1956/57, the club reached the 2nd Round before losing 4-0 at Millwall. In 1957/58 Margate were runners-up in both the Kent League and Kent League Cup and again reached the 1st Round of the FA Cup, losing 3-2 at home to Crystal Palace. The following season, 1958/59, was Margate's last in the Kent League and the club finished 5th as well as losing in the Kent League Cup Final once more. Southern League football returned to Hartsdown Park in the 1959/60 season when the expansion of the League led to a mass exodus from the Kent League, causing it to fold. Floodlights were erected in September 1959 and the first game played under the floodlights was against Yiewsley on 23.9.59. On 12.10.59 West Ham visited Hartsdown Park to mark the official switching on of the lights. The first season back in the Southern League Division 1 saw Margate finish a respectable 7th and the club reached the 2nd Round of the FA Cup once again, losing 3-0 in a replay at Crystal Palace watched by a crowd of 29,300. During the season further concrete terracing and the walls around Hartsdown Park were constructed. Margate just missed out on promotion to the Premier Division of the Southern League in 1961/62, a season in which the players tunnel was constructed under the main stand at Hartsdown Park. The club also took the bold step of buying their own coach in September 1961, the aim being to save money on travel expenses in the long term. On the field Margate lost 4-3 on aggregate to Cambridge United in the two leg final of the Southern League Cup despite having taken the lead in both games and the club also became FA Cup giant-killers. Margate were drawn away to Third Division leaders Bournemouth in the 1st Round and pulled off a shock 3-0 win, Bournemouth had previously been unbeaten at home. In the 2nd Round Margate drew 1-1 at home to Notts County but lost the replay 3-1. The 1962/63 season was a very successful one for Margate as they won the Southern League Division One and thus gained promotion to the Southern League Premier Division. The team also won the Kent Floodlight Cup, Kent Senior Shield and once again made the 1st Round of the FA Cup, losing 3-1 at Millwall. The following season Margate lost to Brentford 2-0 in a 1st Round replay at Hartsdown, having drawn 2-2 at Griffin Park. In the summer of 1964 the floodlights at Hartsdown Park were replaced and the new lights were first used during a 4-2 defeat against Bexley United on 14.9.64. The old pylons were sold to Canterbury City and later City sold them on to Whitstable. As late as the 2012/13 season the lights were being used by amateur club Woodnesborough. Margate made the bold decision to turn full-time professional for the 1964/65 season and the club achieved their best-ever league position of 6th place as a result. However the following season was a disaster and Margate finished bottom of the Premier Division, thus being relegated back to Division One having failed to win a single away game in the Southern League during 1965/66. That led to the full-time policy being scrapped and Margate became a semi-professional club again. In June 1966 Margate embarked on a trip to West Germany and the squad that travelled included Ramsgate's player-manager Les Riggs who later took charge of Margate. Margate played three matches in and around the Stuttgart area, winning two and losing one. The 1966/67 season was a far better one, Margate were runners-up in Division One, finishing a point behind Dover, and so immediately regained their Premier Division place. The club also won the Southern League Merit Cup (for being top goalscorers in the entire league) and the Kent Floodlight Cup. Centre-forward Dennis Randall set a new club goalscoring record during the season, finding the net on 54 occasions. In the early part of the season the clubhouse at the top end of the ground was opened. In 1967/68 Margate lost 4-0 at home to Peterborough in the 2nd Round of the FA Cup but won the Southern League Cup after an epic trio of games against neighbours Ramsgate. The first leg at Hartsdown finished 1-1 and the return leg at Southwood was a 0-0 draw. In the replay at Hartsdown Margate won 3-1 with John Fahy scoring a hat-trick. In the summer of 1968 Margate toured West Germany once again but during the 1968/69 season the club struggled and only avoided relegation due to having a goal average that was just 0.16 better than Cheltenham's. Margate lost 3-1 at Northampton in the FA Cup 1st Round during the campaign. The following season, 1969/70, saw the club go down 7-2 at home to Aldershot in the FA Cup 1st Round and a poor Southern League Premier campaign. At the end of the season Almer Hall stepped down as manager after 20 years in the job and Gerry Baker took over as player-manager for the 1970/71 campaign. He was a well-known striker who'd scored 100 goals in both the English and Scottish First Divisions and got the job in preference to David Pleat after a close vote by the club committee. Former Tottenham star Cliff Jones was another of the candidates interviewed. Despite no longer being in charge of team affairs Almer Hall stayed on and assisted Gerry Baker with scouting, etc before finally leaving the club in the summer of 1971. Things didn't work out for Gerry Baker and he resigned at the end of September 1971, with Ramsgate manager Les Riggs taking over at Hartsdown Park a few weeks later. That was shortly before Margate were thrashed 11-0 at Bournemouth in the FA Cup 1st Round during November 1971. Ted McDougall famously scored a record nine goals in the game and for Bournemouth it was revenge for their 1961 defeat at Margate's hands. During the following season, 1972/73, Margate beat Swansea at home and Walton & Hersham away to reach the 3rd Round of the FA Cup for only the second time in the club's history. The club were drawn to play Tottenham at Hartsdown Park in January 1973 and a record crowd of 14,169 saw the First Division side win 6-0. The Spurs team included the likes of Pat Jennings, Martin Peters and Martin Chivers. Also in January 1973 Margate's 15 year-old defender Dave Carr was signed by Luton. As the 1970's progressed Margate remained in the Southern League Premier Division but made little impact, generally finishing mid-table. But the club had slightly more success in cup competitions and beat Maidstone to win the Kent Senior Cup in 1973/74, a season in which Margate played on a Sunday for the first time when Bognor Regis Town visited Hartsdown Park for a Southern League Cup tie on 27.1.74. During the season talks were held with Ramsgate to discuss the possibility of merging the two clubs due to falling attendances and both clubs having financial problems as a result. The plan was to call the proposed new club Thanet United and to build a new ground in the Westwood area - between the two towns. However nothing came of the idea. In the summer of 1974 Margate played West German Second Division side Bonner in a friendly at Hartsdown Park and manager Les Riggs splashed out a club record fee of over £2,000 for Rotherham striker Carl Gilbert. His signing came shortly after Margate's annual meeting had revealed a loss of around £3,000 for the 1973/74 campaign. During the 1974/75 season Margate had spells as leaders of the Southern League Premier Division but fell away during the second half of the campaign. However the team reached the final of the Southern League Cup, losing to Kettering over two legs. They also managed a run of seven successive clean sheets from 17.2.75 to 15.3.75. The season also saw the retirement of long-serving Bob Wainwright who'd served Margate for 25 years as trainer and then groundsman. In the summer of 1975 Margate took on League Champions Derby County in a friendly at Hartsdown Park and during the 1975/76 season the club won the Kent Messenger Cup. A notable player during the campaign was England Test cricketer Graham Roope who made two appearances in goal. The 1976/77 season was a traumatic one as financial problems led to further talks with Ramsgate about a merger and the formation of Thanet United (the new club was to play at Hartsdown Park) but Ramsgate decided not to be part of the scheme. Despite the Rams opting out, at a meeting in January 1977 those present decided that Margate should go ahead with the name change for the following season but a further vote a month later saw the idea abandoned once more. In March 1977 Les Riggs left the club, frustrated by budget constraints, and Margate finished the season bottom of the Premier Division and were relegated for the first time in over 20 years. After former Chelsea and England star Bobby Tambling had turned down the post, Dennis Hunt became the club's new manager in May 1977 and Margate made an immediate return to top flight football by winning the Division One title in 1977/78. The club also won the Merit Cup for the second time and a new record transfer fee was set when Folkestone defender Neil Cugley was signed for £3,500 in March 1978. In June 1978 Dennis Hunt announced plans to develop youth players and soon afterwards the details of Margate's debts were revealed. The 1978/79 campaign gave the club the opportunity of gaining promotion to the newly-formed Alliance Premier League for it's inaugural season the following year. Margate had to finish in the top thirteen teams in the Southern Premier League to be admitted but could only finish 19th. As a result the club were placed into the Southern Division of the new-look Southern League and would stay there for almost 20 years. During the season there was a lot of behind-the-scenes upheaval and in November 1978 former Margate player Jack Smith replaced Dennis Hunt as manager. Hunt had been asked to resign after a humiliating 7-1 defeat by Woking in an FA Cup 4th Qualifying Round tie on 4.11.78 but when he refused the club advertised for a new manager and told him that he would be able to stay on in a coaching capacity. However in January 1979 Hunt was dismissed in a move that made headlines in the Thanet local press. Financial problems abounded and in May 1979 the players agreed to forego their wages for the remainder of the campaign. Then in June 1979 Jack Smith left the club and Terry Morris, another former Margate player, took over as manager. The first season in the Southern Division was poor and saw Margate finish 17th in the table. But the 80/81 campaign was even worse and the club ended up in 22nd position with finances still a major problem. In November 1980 all the clubs contracted players were transfer-listed and as a result the likes of Vic Pain, Terry Norton and Ray Summers departed to cut costs - there had already been two wage cuts prior to that. Margate finished the season with a team made up of local youngsters and a few veterans, including 1960's players Paul Thomas, Dai Yorath and Phil Gilbert. During the course of the campaign Margate once again entered into negotiations with neighbours Ramsgate about a possible merger. As previously discussed in the 1970's, it was suggested that a new club, Thanet United, should be formed in a bid to attract bigger crowds and more sponsorship / commercial revenue as it was thought that having Thanet in the club name would be more appealing to businesses. However Ramsgate pulled out of the plans but Margate went ahead alone with the formation of Thanet United. The renamed club began the 1981/82 season with no debts, having cleared £30,000 worth in the preceding two years, but the campaign was a disaster. Thanet United failed to win any of their first fifteen Southern League Southern Division games, crashed out of the FA Cup to Kent League Deal and finished bottom of the league. Off the field as crowds dropped to an all-time low yet more merger talks took place and it seemed likely that Ramsgate would finally come on board. But when Thanet District Council announced that they would not be prepared to put any funding into the new club the idea was put on ice once more. Meanwhile United's financial position had again become precarious and the playing staff's wages were cut early in 1982. The 1982/83 season was a marginally better one for Thanet and the club finished 14th in the 18 team Southern League Southern Division. Manager Terry Morris resigned in November 1982 and Peter Donnelly took charge in a caretaker capacity for the rest of the season, guiding United away from the relegation zone when a drop into the Kent League had been likely. A major talking point during the season was the issue of Thanet players also playing for Sunday League clubs and star striker Lennie Lee left the club early in 1983 as a result of the problem. The situation arose due to United not having any contracted players and so having no powers to stop players turning out for Sunday clubs. Off the field, finances were still a concern and in November 1982 Thanet District Council considered re-possessing Hartsdown Park when it emerged that Thanet United did not have a lease for the council-owned ground. The lease was still in the name of Margate FC but the situation was eventually resolved and United were allowed to stay on. Tellingly in January 1983 Thanet chairman Jim Horsham admitted that the name change from Margate had provided none of the advantages that had been hoped for. Alan Fagan became Thanet's new player-manager for the 1983/84 season but after winning only one Southern League match he resigned due to work commitments in November 1983. Former Margate player John Wickens took over as manager and after another season of struggle he just managed to guide United clear of the relegation zone, the club finishing the 1983/84 campaign 18th out of 20 in the Southern Division. The club's finances were improved when a sponsorship deal was struck with Invicta Motors of Margate and that led to the team shirts having a sponsor's name on them for the first time. During the season the club's supporters club disbanded and the problem of players also turning out for Sunday clubs continued with several United players having to miss matches due to suspensions received for offences committed with their Sunday sides. Before the start of the 1984/85 season John Wickens banned all the Thanet players from playing Sunday football and the campaign saw a dramatic improvement in the club's fortunes as United finished fifth in the league and were the only team to top the table other than eventual champions Basingstoke Town. Thanet were in with a genuine chance of promotion to the Southern League Premier Division until a hectic run of fixtures in April and May 1985 took it's toll. But finishing as runners-up in the Courage Eastern Floodlight Cup, losing to Bishops Stortford in the two legged final, was some consolation and three players - Vic Medus, Karl Lloyd and Gary Pugh - topped 20 goals for the season. In the summer of 1985 the clubhouse at Hartsdown was extended, doubling it's capacity, and it was officially opened in September 1985. Despite adding several experienced players such as Folkestone duo Billy Plews and Bobby Wilson to the squad for 1985/86 Thanet faded badly after a promising spell around Christmas and eventually finished the season in a disappointing seventh from bottom position in the Southern Division. Towards the end of the campaign John Wickens was forced to instigate wage cuts. The summer of 1986 saw American Football being played at Hartsdown Park, local club Thanet Vikings played their Budweiser League matches at the ground as the Thanet United management sought to bring in much needed extra revenue. The 1986/87 season saw Thanet start brightly once more and they were league leaders for a few weeks, only for their hopes of promotion to the Southern League Premier League to fade away after Christmas. During the early part of the campaign the club's management committee explored the possibility of reverting back to the name of Margate FC and the idea was approved by the Football Association. But the proposed name change was scuppered when the F.A. warned that the club would lose it's full membership and several fringe benefits associated with that status. In March 1987 John Wickens was sacked and Norman Fusco became Thanet's new player-manager, initially on a temporary basis. He guided the team to an eleven match unbeaten run through to the end of the season and in April 1987 he was appointed as Wickens' permanent successor. Thanet started the 1987/88 campaign very well and reached the 4th Qualifying Round of the FA Cup after an impressive replay win at Woking in the previous round. On 24.10.87 United faced Bognor Regis at Hartsdown for a place in the 1st Round Proper, just days after the Great Storm of 1987 had caused extensive damage to the ground. Thanet went down 4-0 and the defeat was the team's first since Fusco had taken over, a run that had extended to 24 matches. In the league Thanet's form again tailed off during the later stages of the season, particularly after leading scorer Neil Cugley was sacked by the club in March 1988, but United still managed to finish fifth, equalling the club's previous highest position. The following campaign was something of a disaster. After an indifferent start Thanet's problems began in earnest when four players were sent off during an FA Trophy 2nd Qualifying Round tie against Leatherhead at Hartsdown on 22.10.88. Norman Fusco was one of the United players dismissed and a few days later he resigned as player-manager, claiming that he hadn't been paid since the start of the season. Garry Aldous became Thanet's new player-manager but started his tenure with a run of ten games without a win. By the end of 1988 United had only won three league games and relegation to the Kent League began to look like a genuine possibility in a climate of severe financial problems and boardroom upheaval. In January 1989 rumours abounded that Thanet were about to fold but the club issued a statement denying the suggestion and in March a new Board of Directors was appointed. One of their first tasks was to announce that the club would be reverting to the name of Margate Football Club for the 1989/90 season and they also confirmed that they were to clear the club's debts which were in the region of £30,000. On the field Aldous managed to guide Thanet to safety but at the end of the campaign the manager's job was advertised nationally. In May 1989 the club's board submitted plans to Thanet District Council in the hope of doubling the size of the Hartsdown stadium complex and shortly afterwards it was revealed that former Maidstone United manager John Still had turned down the offer of the Margate manager's job. He had been the club's first choice and three other candidates were then interviewed. In June 1989 Trevor Ford was unveiled as the new manager with former Charlton winger Colin Powell as his assistant and the duo joined Margate after a successful spell in charge of Bromley. Around the same time the already condemned North Stand was demolished as it was deemed to be a fire hazard and on the field there were major changes as Ford brought the bulk of his Bromley side with him to Margate, retaining only two players from the previous season's Thanet squad. The club's new era began with a prestige friendly against Arsenal to celebrate 60 years of football at Hartsdown Park and the Gunners' strong side featuring the likes of Brian Marwood, Paul Davis, Nigel Winterburn and a young Andy Cole won 4-1. Things didn't work out for Ford and he resigned in March 1990 after a disappointing run of results. He was succeeded by his assistant Powell and a poor season ended with Margate finishing 16th in the 22 team Southern League Southern Division. Meanwhile the reserves won the Kent League Division 2 title under future Ramsgate manager Jimmy Ward and during the season the fanzine craze arrived at Hartsdown Park with two different publications appearing. The 1990/91 season turned out to be a turbulent one and Margate had three managers during the campaign. Colin Powell resigned in October, a week after a shock defeat at Peacehaven & Telscombe in the FA Cup. The loss was Margate's first ever at the hands of a Sussex County League club in the competition. Powell was replaced by former Dover boss Steve McRaye, initially on a temporary basis. After having his post made permanent in December 1990 McRaye was replaced by former West Ham defender Tommy Taylor in January 1991. Under Taylor results picked up towards the end of the season but a mediocre campaign saw Margate finish 10th out of the 21 teams in the Southern League Southern Division. The club made several high-profile signings during the season, most notably former Charlton, Crystal Palace and QPR striker Mike Flanagan and ex-Gillingham defender Mark Weatherly. Off the field ambitious plans for a new stadium complex at Westwood (between the towns of Margate and Ramsgate) were unveiled towards the end of 1990 but in February 1991 Thanet District Council refused Margate permission to pursue the project. In the summer of 1991 veteran former Leyton Orient players Bill Roffey and Peter Kitchen were amongst Tommy Taylor's new recruits and the Thanet local press believed that Margate had a genuine chance of making a promotion challenge during the 1991/92 campaign. Such hopes all but evaporated when the club endured a torrid start to the season, losing the first three Southern League games and winning only once in their opening nine matches. At the end of August 1991 striker Paul Underwood, Margate's leading scorer during 1990/91, was sold to Fisher Athletic for an undisclosed fee that was rumoured to be a club record. Although league results improved slightly Taylor resigned in October 1991 and Mark Weatherly initially replaced him in a caretaker capacity. Weatherly won the Southern League's 'Manager of the Month' award before former Margate goalkeeper Lee Smelt was appointed as the club's new permanent manager towards the end of November 1991. In March 1992 Underwood returned on loan but he failed to resolve Margate's goalscoring problems and at the end of March there was a significant departure when long-serving keeper Joe Radford left the club, joining Hythe in a straight swap for Andy Allon. Margate eventually finished 14th in the 22 team Southern League Southern Division - yet another disappointing campaign. Mark Weatherly became joint manager with Lee Smelt for the start of the 1992/93 campaign and Margate's new signings included locally-based striker Lennie Lee, back after a hugely successful spell at Dover, and popular centre backs Dave Carr and Billy Plews. The season started brightly as a 4-1 win over Wealdstone at Watford's Vicarage Road ground launched a run of five consecutive victories, equalling the club's best post-war start, and Margate were unbeaten in their first ten games. In September 1992 Smelt left the club to pursue a career in the police force leaving Weatherly in sole charge but a run of seven consecutive defeats in October and November 1992 saw any hope of a promotion challenge all but evaporate. In December 1992 former Irish international Damien Richardson joined Margate to assist Weatherly but he left the club after a month and in February 1993 former Margate and Thanet player Andy Woolford returned to Hartsdown Park to become joint manager with Weatherly. Margate finished the season in 10th place in the 22 team Southern League Southern Division and were indebted to Martin Buglione who scored 38 first team goals and 52 in total including Kent Midweek League games before being sold to Scottish Premier League Club St Johnstone in March 1993 for an undisclosed club record fee. He was the first Margate / Thanet player to score 30 goals in a season since Brian Gregory during 1975/76 and Buglione scored three consecutive hat-tricks during August and September 1992. Off the field Margate had some good news when Thanet District Council agreed to give the club a new 125 year lease on Hartsdown Park and the club announced bold plans to develop the stadium and it's surroundings. These included utilising the adjacent nursery site and enclosing the football pitch on Tivoli Park. In the summer of 1993 the floodlights Margate had installed in 1964 were replaced by a set acquired from Dartford when the Darts went out of business in the opening weeks of the 1992/93 campaign. On the field the 1993/94 season started promisingly and in September 1993 Margate signed striker Steve Cuggy from Dover Athletic for an undisclosed club record fee believed to be £5,000. He soon struck up a great partnership with Joe Brayne who'd been the Kent League's top scorer during 1992/93 whilst playing for Deal. Margate flirted with the leadership of the Southern League Southern Division for the first two months of the season but a run of five consecutive league defeats in November 1993 was a near-fatal blow to the club's promotion hopes and another run of five defeats in March 1994 killed off any lingering thoughts of finally escaping the Southern Division although a 9th placed finish was Margate's best since the 1987/88 campaign. In the FA Cup Margate suffered a humiliating 5-2 defeat against Metropolitan Police and several players had cash and valuables stolen from the dressing rooms during the match - quite ironic considering it was played at the Met's ground. The undisputed highlight of the season and the club's greatest day since gaining promotion in 1978 came in May 1994 when Margate beat Chris Kinnear's Dover side 2-1 in a memorable Kent Senior Cup Final at Gillingham's Priestfield Stadium. After Billy Plews' early header had given Margate the lead Conference club Dover equalised and with the game looking certain to go into extra time substitute Joe Brayne scored the winning goal deep into injury time. It was Margate's first Kent Senior Cup win for 20 years and before the cup run started the club hadn't even won a match in the competition since 1984/85. At the end of the 1993/94 season joint managers Mark Weatherly and Andy Woolford both stepped down. Woolford became Margate's coach for 1994/95 and Weatherly stayed on as a player, also taking responsibility for coaching the club's youth players. As they searched for a new manager Margate's board held talks with Herne Bay's Tommy Sampson but he couldn't agree terms and Bill Roffey ended up returning to the club as manager for the new season. Roffey's first signing was former Charlton goalkeeper Bob Bolder who joined Margate on a two year contract in a blaze of publicity in July 1994 but left the club to join Dagenham & Redbridge for a fee a few weeks into the 1994/95 campaign without making a competitive appearance. The Bolder debacle set the tone for the rest of the season which was, at best, mediocre. Roffey soon made a comeback as a player as Margate's resources were stretched and the club finished 13th in the Southern Division with Steve Cuggy's 40 goals papering over a lot of cracks. In April 1995 Roffey resigned after a run of one win in 11 games and Mark Weatherly and his fellow former Gillingham star Karl Elsey took over as joint caretakers for the remainder of the season. Immediately after the last match of the 1994/95 campaign Karl Elsey was confirmed as Margate's new player-manager and shortly before the start of the new season Steve Cuggy was sold to Hastings Town. The fee was undisclosed by Margate but The Sun newspaper ran a story about the transfer as Sussex-based lottery winner Mark Gardiner had paid for Cuggy. The report said the amount concerned was £13,000 but Margate later said that figure was incorrect. Cuggy's replacement was the prolific Martin Buglione, returning to the club after a spell with Sittingbourne that followed his time with St Johnstone. Buglione went on to score 38 goals to take his career total for Margate past 100 and he was the Southern Division's leading scorer. Another significant summer signing was former Dover centre back Tony Dixon whilst left back Eliot Martin joined from Gillingham during the season. In October 1995 the latest ambitious plans to redevelop Hartsdown Park and it's surrounding areas were vetoed by Thanet District Council and in November 1995 the main stand the ground was closed for several weeks after being declared unsafe by Health & Safety officials. In March 1996 Elsey was sacked following a run of three successive defeats which effectively summed up yet another indifferent season for Margate. Mark Weatherly again stepped in as caretaker manager for the remainder of the campaign that saw the club finish 11th in the Southern Division. In the summer of 1996 former Dover boss Chris Kinnear was appointed as Margate's new manager and his arrival genuinely heralded the start of a new era for the club after so many false dawns. Margate's new sponsors were Link Music and that led to 80's pop star Buster Bloodvessel becoming linked with the club, something which attracted a lot of publicity. The name of Buster's band 'Bad Manners' was emblazoned on Margate's new shirts, the group were with the Link Music record label, and he occasionally watched matches at Hartsdown. The 1996/97 season also saw Margate celebrate their centenary and Kinnear took the club to 5th place in the Southern Division, helped by an unbeaten run of 14 games at the end of the campaign. It was Margate's best finish for nine years. The 1997/98 season was Margate's most successful for years, the club finished 6th in the Southern Division and also won the Southern League Cup and the Kent Senior Cup. In the Southern League Cup Margate beat Redditch 2-1 on aggregate and a goal from captain Tony Dixon was enough to see off Gravesend in the Kent Senior Cup Final at Stonebridge Road. Margate also reached the 1st Round proper of the FA Cup for the first time since the 1972/73 season. Having won at Staines in the 4th Qualifying Round Margate were drawn to play Fulham at home - the 'plum' draw of the round. It was just after Mohammed Al Fayed had taken control of Fulham and the club were managed by ex-England star Ray Wilkins with Kevin Keegan in an 'upstairs' role. The tie attracted Sky TV's cameras to Hartsdown Park and the match was broadcast live. A crowd of 5,100 saw Margate take the lead with an early Mark Munday penalty but Fulham rallied to win 2-1. Margate also pulled off a major shock in the FA Trophy during the season. They travelled to Surrey to meet holders Woking and won 1-0 thanks to a brilliant Eliot Martin goal. Margate's run of success continued when they finished 2nd in the Southern Division during the 1998/99 season and gained promotion to the Southern League Premier after almost 20 years in the lower division. However the club were only allowed up after a tense period during which the Southern League initially refused to grant the promotion. That was because work carried out by Margate on Hartsdown Park to bring it up to Southern Premier standard was not completed by a required deadline. But the club made a successful appeal to the Football Association and were thus allowed to take their place in the Southern League Premier Division for the 1999/00 season. There were fears in some quarters that Margate might struggle in the higher division but an opening day win at title favourites Worcester City quickly dispelled that notion. Margate eventually finished in an impressive 3rd place, the highest league position in the club's history at that time. During the 2000/01 season the controversial Thanet Stadium scheme to build a new out-of-town ground finally fell through. With Margate pushing for promotion the decision was made to do the work necessary to bring Hartsdown Park up to Conference standard. Amongst the improvements in the £175,000 works were the construction of a new terrace where the old North Stand had been before being demolished some 20 years earlier and new seats being installed into the 70 year-old main stand. The famous slope of the Hartsdown pitch was also reduced in accordance with Conference regulations. All the club's efforts paid off when Margate won the Southern League Premier for the first time in the club's history, beating Burton Albion to the title after the sides had been neck-and-neck for much of the season. The title win was sealed on an emotional night at Hartsdown when 2,366 saw Margate draw 0-0 with Newport County and Margate were promoted to the Nationwide Conference - a remarkable achievement by Chris Kinnear and his team. During the season John Keister became the first Margate player in history to gain a full international cap whilst with the club when he played for Sierra Leone against Nigeria in a World Cup Qualifier. The 2001/02 season saw Margate get off to a great start in the Conference, a Leon Braithwaite penalty helping the club to a 1-0 win at eventual champions Boston on the opening day of the campaign. For a few hours Margate even led the table after beating Stevenage 2-1 at Hartsdown Park but a mid-season slump led to the team eventually finishing in a highly-creditable 8th place. On the final Saturday of the season Margate thrashed Stalybridge 8-0 at Hartsdown to seal a good first campaign at the highest level of non-league football. During the summer of 2002 it was announced that Margate would be playing their home matches in the 2002/03 season at Dover Athletic's Crabble Athletic Ground. That was because plans were afoot to completely redevelop Hartsdown Park as the ground had to be upgraded to Football League standard or else Margate would be relegated from the Conference. The 2002/03 season began with a 1-1 draw against Morecambe at Crabble but Margate's Conference form was indifferent leading up to Christmas 2002. However a 2-1 win at Gravesend in November put Margate into the 1st Round proper of the FA Cup and a tie away to Division 3 strugglers Leyton Orient. A 1-1 draw at Brisbane Road was followed by a memorable 1-0 win at Crabble, John Keister scoring the winning goal from the penalty spot having scored Margate's equaliser in the initial game. This was Margate's first win over a Football League club since they'd beaten Swansea during the 1972/73 FA Cup run. A 2nd Round tie at home to Division 2 high-fliers Cardiff City followed but the day was something of an anti-climax as the Welsh club won 3-0 in front of a very disappointing crowd of only 1,362. However two days earlier there had been great news for Margate when Thanet District Council finally approved the club's plans to re-develop Hartsdown, in partnership with a company called Stadia Management, after protracted negotiations. Margate eventually finished the Conference season in 10th place and rounded off the season by winning the Kent Senior Cup, beating Welling 2-1. The club also made a surprise return to Hartsdown Park during the campaign, playing six matches there between December 2002 and February 2003 due to problems with the pitch at Crabble. The 2003/04 season was probably the most traumatic in Margate's history and it was almost entirely dominated by the Hartsdown Park saga. In June 2003 demolition work finally began on the old ground with the aim of having the new stadium ready for the start of the 2003/04 campaign. But although three sides of the stadium were rapidly demolished, including the original main stand that dated from 1929, delays in construction meant that Margate began the 2003/04 season at Crabble once more. In the months that followed various deadlines for building work to begin came and went without anything happening and concerns grew amongst supporters with the remains of the old Hartsdown Park, including two huge piles of earth where the pitch had been, looking a sorry sight. Then in October 2003 it was announced that Stadia Management and the club had gone their separate ways, leaving Margate in a very difficult position. New plans had to be submitted to Thanet District Council at short notice in the hope of work on the stadium finally starting so that the club could return home by the end of the 2003/04 season. More bad news followed in November 2003 when the Conference board announced that Margate would be fined £5,000 for every match that had to be rearranged at Crabble after 31.12.03 - the deadline date that had previously been agreed for Margate to return to Hartsdown. Meanwhile events on the field were not much better and the team were in danger of becoming involved in a relegation battle as 2003 ended. A string of 'home' defeats at Crabble were followed by an early FA Cup exit at the hands of Grays and in November 2003 popular midfielder Terry McFlynn was sold to Morecambe for £14,000 - the highest fee received ever officially disclosed by the club. Things went from bad to worse in January 2004 when chairman Jim Parmenter suddenly resigned just days before a critical meeting about the stadium project was held at Thanet District Council. On 15.1.04 the council voted against Margate's current stadium plans and at this time the entire future of the club seemed to be in the balance. Wages went unpaid for a period and the entire Margate squad and management team were given the option of leaving the club. But the club pulled through to see out the season and while yet more negotiations took place off the field the team's fortunes on the pitch improved dramatically. A good run of form saw the team lose only two of their last ten Conference 'home' games and Margate eventually finished 16th in the Conference, comfortably clear of the relegation zone. This was a fine achievement considering all the problems the club had been forced to endure and on 28.4.04 Margate rounded off the season by retaining the Kent Senior Cup with a 2-1 win at Folkestone. This was only the second time the club had won back-to-back Kent Senior Cup Finals, having previously done so by winning the 1935/36 and 1936/37 competitions. With the season over, the summer of 2004 looked set to be another critical period for Margate FC and the club faced a race against time to finally gain approval for the stadium project and to maintain their Conference status. In May 2004 Margate asked the Nationwide Conference board to approve a further ground share agreement with Dover for the 2004/05 season but the league rejected the club's proposal. This led to an Emergency General Meeting being held at the remains of Hartsdown Park on 20.5.04 and the result was that the club's shareholders voted to accept demotion to the new Conference South league. It was hoped that Margate would be able to return home to a partially re-built Hartsdown, in line with the Conference South's less stringent stadia criteria, early in the 2004/05 campaign. By the end of May 2004 it was clear that manager Chris Kinnear faced the prospect of totally rebuilding his squad for the new season as long-serving Jay Saunders and Graham Porter - the club captain - led a mass exodus of players when they joined Kent rivals Gravesend & Northfleet on free transfers having been out of contract at Margate. Fans' favourite Sam Sodje was next to go, the talented central defender joined Second Division Brentford, thus becoming the first Margate player to join a Football League club since Mel Blyth in 1978. Before the summer was over goalkeeper Phil Smith joined Crawley, midfielder Jake Leberl moved to Dagenham & Redbridge, Jean-Michel Sigere signed for Hornchurch and Darren Watson left the club for a trial at Grimsby. Margate began the 2004/05 season in the Conference South at a new temporary home - Ashford Town's Homelands ground. With the stadium saga still dragging on and a much-changed squad Chris Kinnear's team struggled during most of the campaign. In January 2005 the club was on the very brink of going out of business as talks with Thanet District Council regarding the commercial aspects of the proposed new Hartsdown Park development reached a critical stage. Wages went unpaid and a transfer embargo was enforced by the Conference but towards the end of February 2005 there was finally some good news for Margate's long-suffering supporters. The company behind the proposed commercial development at Hartsdown Park agreed to provide funds for the building of a temporary stadium at Hartsdown whilst discussions with Thanet District Council continued. This meant that Margate would be back home in time for the 2005/06 season if all went well. Meanwhile the team had been dragged into trouble at the foot of the Conference South table and a thoroughly miserable season ended with relegation to the Isthmian League Premier Division, the first genuine demotion the club had suffered since the 1976/77 campaign. Shortly after relegation was confirmed Margate went into administration and were docked ten points which by then made no difference to the club's fate. The final match of the season saw Margate win the Kent Senior Cup for the third successive time, beating old rivals Dover 2-1 in the final at Folkestone. The game was a fitting tribute to former Margate star Paul Sykes who tragically died whilst playing for Folkestone in the semi final against Margate on 12.4.05 and all the proceeds went to his family. In the summer of 2005 work finally began at Hartsdown Park and Margate's new temporary stadium began to take shape. In July 2005 Thanet District Council approved the plans for the commercial development at the ground and the club announced that they hoped that work would begin on the full stadium by the turn of the year. Although the club remained in administration with the transfer embargo no longer in force, a firm budget for the playing staff in place and the ground saga seemingly drawing to a conclusion hopes were high that Chris Kinnear would be able to build a squad to challenge in the Isthmian League Premier Division, Margate's first ever taste of Isthmian League football. The start of the 2005/06 season saw a bumper crowd of 1,279 at the new temporary Hartsdown Park to witness the return of the club to Margate and a goal from Leon Braithwaite, himself returning to the club, was enough to secure a 1-0 win over Maldon Town. But despite the club's return home the campaign turned out to be a disappointing one and there were early exits at the hands of lower league opposition in both the FA Cup and FA Trophy whilst league results were erratic. Forced to adopt something of a 'trial and error' policy Chris Kinnear used well over 40 players in a bid to put together a winning side but despite excellent wins over the likes of AFC Wimbledon and Hampton & Richmond there was little consistency in the team's performances. By early April 2006 Margate were only just above the relegation zone in the Isthmian League Premier Division and immediately after a 1-1 draw at home to Windsor & Eton on the evening of 4.4.06 Kinnear and his assistant Kevin Raine were asked to resign. When they asked for time to consider such a step they were both suspended by the club for the remainder of the season. To all intents and purposes the pair had been sacked and Kinnear's near ten year reign had come to a sudden end. It was a sad way for arguably the most successful manager in Margate's history to bow out. Immediately after Kinnear's departure former Gillingham defender Robin Trott was appointed as caretaker player-manager for the remainder of the season. He had only joined the club in January 2006. Trott appointed former Charlton, and briefly Margate, player Mike Flanagan as his assistant and guided the club to 14th place in the 22 team Isthmian League Premier Division by the end of the campaign with an unbeaten run of five games. After the last game of the season, a 4-2 win over Hendon at Hartsdown, Trott was confirmed as the permanent successor to Chris Kinnear with a target of gaining promotion during the 2006/07 campaign. May 2006 saw Trott stamping his authority on his new role and long-serving fans' favourite Bill Edwards was released along with several other players including experienced midfielder John Keister. New signings included three players recently released by Conference outfit Gravesend & Northfleet - Justin Skinner, Steve McKimm and Jimmy Jackson - whilst another former 'Fleet man Lee Protheroe signed on a permanent basis after a successful loan spell at the end of 2005/06. With former Gillingham player James Pinnock also joining the club the prospects for the 2006/07 looked rosy and although work on the stadium project was delayed once again there was talk of building finally starting in March 2007. A key part of the latest plans was for the pitch at Hartsdown to be turned around and a motorcycle testing centre was to form a major part of the scheme as a whole. Margate made a good start to the 2006/07 season and Danny Hockton's opening day hat-trick in a 5-2 win at Worthing marked the start of a prolific campaign for him. Hockton went on to score 40 goals, the best tally by a Margate player since Steve Cuggy reached the same total during 1994/95. In September 2006 fans' favourite Jay Saunders made a welcome return to the club but as the season progressed Margate became victims of their own inconsistency, not helped by several early 2007 home games having to be postponed due to problems with drainage on the Hartsdown Park playing surface. Previously it had been virtually unheard of for games at Hartsdown to be called off due to a waterlogged pitch. Margate eventually finished 6th in the Isthmian League Premier Division having topped the table several times and missed out on the play-off positions by one place. With no success in cup competitions the season couldn't really be considered a successful one given the pedigree of the summer signings. Two of the most notable matches of the campaign were the local derbies with Ramsgate who were playing in the same league as Margate for the first time since 1972/73 following two successive promotions. The 1-1 draw at Southwood on 26.12.06 was watched by a crowd of 1,762 and the return match at Hartsdown on 9.4.07 saw Margate win 1-0 thanks to a Hockton goal in front of 1,676. When Robin Trott announced his retained list of players in the summer of 2007 notable departures included long-serving full back Greg Oates and goalkeeper Charlie Mitten, both veterans of Margate's heady Conference days. Lee Protheroe, centre back James Donovan and midfielder Paull Abbott were amongst the other players released. In June 2007 the club's seemingly never ending off-field problems continued as a winding-up order was requested by HM Revenue and Customs due to a late payment of PAYE contributions. They wanted the club to be liquidated although Margate stated that all payments had now been made. The club also confirmed that all payments under the Company Voluntary Arrangement (CVA) set up in 2005 had been made as agreed. Meanwhile various announced start dates for work on the proposed 5-a-side football centre adjacent to Hartsdown Park came and went without any construction taking place and the temporary stadium itself was still as it had been when the club returned home for 2005/06. By July 2007 with the pre-season friendlies looming only one new signing had been confirmed - midfielder Michael Yianni from Ramsgate - and with the prolific Danny Hockton being sold to Bromley for an undisclosed fee there was considerable concern amongst Margate supporters over the club's prospects for the forthcoming campaign. The 2007/08 season saw five new signings making their debuts on the opening day but Yianni wasn't one of them having suffered a cruciate injury that ruled him out for the entire campaign. Once again Margate were frustratingly inconsistent in the Isthmian League Premier Division and made little impression in either the FA Cup or FA Trophy. Eventually a 9th place finish was secured but with two games to go before the end of the season Robin Trott was sacked having failed to take Margate into the play-offs. Experienced midfielder and player-coach Steve McKimm took charge for the final two matches. Although another season passed without any further stadium development taking place there was some positive news in September 2007 when work finally started on the 5-a-side centre next to the ground and it was opened in December 2007. Shortly after the end of 2007/08 it became clear that all was not well behind the scenes at Margate. Disagreements amongst the board resulted in the long-serving Keith Piper and Colin Page resigning as directors and then soon afterwards Gary Lever withdrew his financial backing. Lever had been a key figure in the proposed redevelopment of Hartsdown Park and had been instrumental in providing the funds for Margate to return home for 2005/06. Meanwhile 2007/08 top scorer James Pinnock and vastly popular midfielder Jay Saunders both joined Maidstone United during May 2008 and as the month wore on supporters concerns about the club's future prospects grew. Off the field events took another turn when towards the end of May 2008 Margate's remaining directors and chairman Malcolm Rowlett resigned leading to Colin Page and Keith Piper withdrawing their resignations. As the boardroom situation began to stabilise former Gillingham defender Barry Ashby became Margate's new manager with his former Gills team-mate Paul Smith joining him as player-coach. A comprehensive restructuring plan also saw locally-based ex-Everton and Wales goalkeeper Neville Southall became the club's Football Development Officer whilst former Wales manager Terry Yorath was announced as Margate's Director of Football at the start of June 2008. By the end of that month three more experienced players had left Margate - Steve McKimm, fellow midfielder Jimmy Jackson and striker Rob Haworth - and the club looked set to field a young side made up of former reserve and youth players for the 2008/09 Isthmian League Premier Division campaign. Margate's new-look team had a poor start to the new season winning only one of their first eight league games. After a humiliating 5-1 defeat at Worthing in the First Qualifying Round of the FA Cup in September it seemed as if things couldn't get much worse but a few days later the club announced that it had been served with another winding up petition by HM Revenue & Customs, just over a year since the last one. The second petition was said to relate to the same monies owing from the previous CVA - a total of approximately £50,000. Towards the end of October 2008 Margate announced they had parted company with manager Barry Ashby after only 15 games at the helm. The club's statement said that he had refused to implement changes to personnel that were required by the directors and Terry Yorath took over as caretaker manager with Neville Southall as his assistant. In November there was some relief for Margate when a deal was struck with HM Revenue & Customs that delayed repayment of the money owed to them and around the same time it was also announced that Yorath and Southall's appointments had been made permanent. By December 2008 Margate were in a precarious position in the Isthmian League Premier Division and had gone out of all four cup competitions they were involved in at the very first hurdle. It was the club's worst ever effort in cup competitions with four losses in four ties. During 1977/78 Margate had also lost in the first round of every competition but took six matches to do so. Before the year was out Thanet District Council refused the club planning permission to build a medical centre as part of the still stalled redevelopment of Hartsdown Park - a fitting end to yet another traumatic year for Margate. Despite showing some improved form on the field towards the end of the season Margate eventually finished fourth from bottom in the Isthmian League Premier Division - the last of the four relegation spots - after losing 4-1 at Staines on the last day of the campaign. The club then faced an anxious few weeks as they waited to find out if they would actually be demoted as various ongoing issues with other clubs in the non-league pyramid made several promotion / relegation issues unclear. Eventually towards the end of May 2009 it was announced that Margate had been reprieved and would take their place in the Isthmian League Premier Division once more for 2009/10. The start of July 2009 saw Margate facing another winding up order and having managed to pay off half of the remaining £50,000 debt to HM Revenue & Customs the club were given a further 12 weeks to come up with the outstanding monies. On the field the team had a mediocre start to the 2009/10 season that included another immediate exit from the FA Cup and towards the end of September 2009 manager Terry Yorath resigned in the midst of a run of matches that saw Margate use six different goalkeepers in six consecutive games. Neville Southall became caretaker manager and in October 2009 there was some good news as Margate gained three new directors including two former chairmen of the club - Richard Piper and Gordon Wallis who was also appointed as Director of Football. Towards the end of October 2009 Ashford Town (Middlesex) boss Mark Butler was installed as Margate's latest new manager and a few weeks into his reign the club finally paid off the remainder of the money owed to HM Revenue & Customs. As a result the Companies Court Winding Up Order was dismissed in court - a significant step forward for Margate. In January 2010 the club announced that Gordon Wallis had resigned from his duties citing ill health and withdrawn his offer of funding and that bad news was followed by Mark Butler's shock resignation at the start of February 2010 after only 15 games in charge. His departure was apparently due to a dispute over his contract demands after he'd initially worked without one. Senior player John Keister, who'd rejoined the club in September, formed a caretaker managerial partnership with midfielder Wayne Wilson before former Margate legend Iain O'Connell became the club's new permanent manager at the end of February. At the same time Chris Kinnear was mentioned as possibly taking up a Director of Football role. With Margate involved in a desperate struggle to avoid relegation O'Connell quickly made numerous signings and the newcomers to Hartsdown Park included old boys Jay Saunders and James Pinnock. In March 2010 the club announced that the winding up petition served against it by HM Revenue & Customs in April 2005 in the sum of £220,000 had been finally dismissed after a final payment of £14,996.35 was made. Meanwhile new boss O'Connell oversaw a run of nine Isthmian League Premier Division games without defeat during March and April 2010 but despite a 1-0 home win over Hastings United in the last match of the season Margate finished fourth from bottom, the same position they'd attained during 2008/09. Once again the club had to wait to find out if they would be reprieved from relegation due to movements / resignations of other clubs in the non-league pyramid and on 17.5.10 confirmation came through that the club would retain it's Isthmian League Premier Division position for 2010/11. In July 2010 the local press reported that Iain O'Connell had opted not to have Chris Kinnear as Director of Football and the manager's new signings included strikers Allan Tait and Jean-Michel Sigere. Sigere had played with O'Connell during Margate's Conference years. Tait ended up leaving the club before the start of the 2010/11 season proper and Sigere only played once before being released. Other new signings included former Dover defenders Craig Cloke and Laurence Ball whilst midfielder Darren Marsden stepped up from Kent League outfit Herne Bay and Sierra Leone international striker Ishmail Kamara spent a few weeks with the club. The early weeks of the 2010/11 campaign were rather hit and miss on the field but towards the end of August 2010 there was good news in the stadium saga. It was announced that plans for two sides of the ground (the 'Coffin End' and the side of the ground where the old main stand stood) had been approved and Keith Piper told the Isle of Thanet Gazette that he hoped the whole development including a Travelodge hotel would be completed within 18 months. In September 2010 Margate lost on penalties at Kingstonian in the 2nd Qualifying Round of the FA Cup but October saw two good home wins over Horsham (6-1) in the league and Whitehawk (5-1) in the FA Trophy. New signing Shaun Welford scored hat-tricks in each of those matches. In November 2010 the first team squad were asked to take a 10% wage cut and during that month Margate had their best result of the season when league leaders Sutton United were beaten 3-2 at Hartsdown Park. But by the end of the year Margate were out of all the cup competitions and below mid-table in the league after failing to show any consistency. January 2011 saw the departure of captain Jay Saunders to Maidstone United and in February another Gate legend John Keister left the club. Incoming players at the start of the year included Sittingbourne striker Tom Bradbrook and Dover defender Dean Hill. The stadium saga took its umpteenth twist in February 2011 when Thanet District Council refused to approve amended plans for the Travelodge hotel. The decision caused consternation as the new plans were for a hotel smaller than the one previously approved by the council. By March 2011 the season was petering out with Margate in no danger of relegation but unable to string together any runs of good results. Before the month was out manager Iain O'Connell suddenly departed and soon Chris Kinnear's former assistant Kevin Raine took up the reigns as caretaker boss. His first game in charge against Concord Rangers at Hartsdown Park was mostly memorable for the first sighting of Kinnear at the stadium since his departure five years earlier and immediately there was talk amongst Gate supporters of a possible return for the former managerial legend. In April 2011 the news many Margate fans had hoped for became public - Chris Kinnear was appointed as the club's new manager. He quickly installed former player Jake Leberl as first team coach and oversaw the last three matches of the 2010/11 campaign. The season finished with Margate 16th out of 22 teams in the Isthmian League Premier Division. In May 2011 Chris Kinnear made his first signing since his return when he snapped up defender Dean Pooley after his release by Ebbsfleet United and before long Aaron Lacy, James Pinnock, Tommy Osborne and Shaun Welford all departed, the latter three to join Maidstone United where Jay Saunders had become manager. At the start of June 2011 it was announced that midfielder Wayne Wilson had become Head of Margate's 'Football in the Community' programme and as the pre-season friendlies got under way in July 2011 attacking midfielder Matt Bodkin and much-travelled striker Adrian Stone became Margate's latest signings. Stone departed before the season proper started, partly due to the excellent goalscoring form of Kwesi Appiah in the friendlies, and other newcomers included midfielders Richard Avery and Liam Coleman. Goalkeeper Jack Smelt also joined the club, following in the footsteps of his father Lee in playing for Margate. On 20.7.11 a significant hurdle in the Hartsdown Park saga seemed to have been cleared when Thanet District Council's Planning Committee approved revised plans for the Travelodge and new stadium but work still didn't begin as it was decided that further public consultation was required on several leases relating to the development. On the field Margate had a patchy start to the new Isthmian League season, winning five of the opening ten games, but Kwesi Appiah's form in particular provided supporters with hope of improvement. On 4.10.11 Appiah was credited with five goals as Margate won 6-1 at Thamesmead Town in an FA Cup replay (the first of them was actually an own goal) to take his official total for the campaign to 11 from 12 outings and his tally continued to grow rapidly over the next few months. Margate finished 2011 on a run of just one defeat in their last eight league matches and further good form at the start of 2012 suggested a play-off place might be achievable. On 19.1.12 a meeting of Full Council recommended the approval of most of the leases required for the Hartsdown Park project to proceed but the proposed lease for an additional full-size pitch behind what had once been the Coffin End was rejected. Meanwhile with transfer deadline day looming Kwesi Appiah turned down a move to Championship club Blackpool but on deadline day itself - 31.1.12 - Appiah got his move back into the Football League when Crystal Palace, also in The Championship, paid Margate an undisclosed fee for his services. Appiah had scored an official total of 35 goals from just 34 appearances. Margate struggled for form, and goals, in the wake of Appiah's departure and lost the first five games after he left which ruled out any chance of making the play-offs. In March 2012 there was a crushing blow to the latest stadium scheme when Travelodge pulled out following delays over Margate's application for a 125 year lease for the hotel site. Thanet District Council had said they required more information about why such a long lease was required and then deemed the initial extra evidence supplied by Margate unacceptable. With the stadium plans up in the air yet again the season petered out and Margate eventually finished 15th out the 22 teams in the Isthmian League Premier Division. The summer of 2012 saw Chris Kinnear make a host of new signings including strikers Carl Rook and Tommy Whitnell as well as former Arsenal reserve team goalkeeper Craig Holloway. The 2012/13 season started with a nine match unbeaten run that took Margate to the top of the Isthmian League Premier Division in September 2012 for the first time since Robin Trott's spell as player-manager and during that month director Keith Piper issued a plea for investment in the club. In November 2012 it was announced that Margate's main sponsor Construct Stadia had gone into liquidation but despite the financial impact on the club Chris Kinnear's team ended 2012 on top of the league table. January 2013 saw the shock departure of Chris Kinnear to his old club Dover and goalkeeper Craig Holloway took temporary charge of the team, assisted by former Premier League midfielder Simon Osborn. After a shaky start under Holloway Margate rallied and enjoyed a run of only one defeat in ten Isthmian League matches during February and March 2013 with new striker Kezie Ibe amongst the goals. With Margate looking likely to make the play-offs Holloway and Osborn were confirmed as the club's permanent new joint managers at the start of April 2013 on contracts running to the end of the 2013/14 campaign but Margate's play-off hopes unraveled immediately as the new management duo oversaw a run of five consecutive defeats. By the time the season ended the poor run of form had been extended to eight games without a win and Margate ended up in ninth place. Meanwhile Hartsdown Park remained unchanged since Margate had returned to the ground in 2005 and there was no word about any progress being made with the stadium project. The summer of 2013 marked ten years since the demolition of the old Hartsdown Park and Craig Holloway and Simon Osborn brought in numerous players ahead of the 2013/14 campaign. Former Football League striker Charles Ademeno was possibly the most eye-catching of the new names whilst tough midfielder Scott Kinch was a familiar figure from his days with Tonbridge and Welling. In the opening weeks of the new season Margate flirted with the top of Isthmian League Premier Division table but a crushing 8-0 defeat at Dover in the Kent Senior Cup, albeit with an under-strength line-up, seemed to have a knock-on effect and league form suffered in September and October 2013. However on 19.10.13 Margate had a remarkable 9-4 win at Wroxham in the FA Trophy. In November 2013 Craig Holloway stepped down as joint manager and after Simon Osborn had taken charge of just four matches as sole manager he was released from his contract in December 2013. On 12.12.13 Margate created a stir in non-league football by appointing former Aldershot and AFC Wimbledon boss Terry Brown as the club's new manager and he signed an unprecedented three-year full-time contract. Brown had previously taken AFC Wimbledon into the Football League and his arrival at Hartsdown Park was seen as a major coup for Margate. Hot on the heels of the news of Brown's appointment came an announcement that wealthy businessman Bob Laslett had taken over the club and become chairman. He'd previously been on the board at Wolverhampton Wanderers for five years and had invested heavily there. Immediately after Laslett's position was confirmed there was finally some news about the redevelopment of Hartsdown Park and it was very positive. Work was to begin no later than February 2014 and the project was due to be completed within 12 months. After many false dawns on the stadium build it seemed that finally things were about to happen and with Terry Brown in charge of the team and Bob Laslett's financial clout Margate's long-suffering supporters had good reason to believe that a bright new era was beckoning. Terry Brown quickly dismantled the Margate squad and a mass of new signings came and went during the remainder of 2013/14. Some of the most significant new additions were goalkeeper Nikki Bull, centre-back Jamie Stuart and Jefferson Louis - the ultimate in much-travelled strikers. The team's form under Brown was initially patchy but Margate ended the season on a run of just one defeat - to champions Wealdstone - from eight matches and finished with three successive victories to secure 11th place in the 24 team Isthmian League Premier Division. Issues with leases prevented work on Hartsdown Park from starting as planned but immediately after the season concluded the club announced that there were to be ground improvements over the course of the summer of 2014. They included extensive work on the pitch to increase drainage, new floodlights and, significantly, the addition of some cover at the far - Coffin - end of the stadium.